Scottish Opera is set to deliver a rousing Scottish salute to the Royal Air Force at the RAF in Concert tour, where the curtain will be brought down on RAF100 for the final time. The concert, which reaches Glasgow Royal Concert Hall on Wednesday, October 3, will showcase Scottish Opera's Outreach and Education RAF100 project which involves schools, adult groups and universities across Scotland. Members of Scottish Opera Young Company and a 100-strong choir of children and adults including students from East of Scotland Universities Air Squadron and pupils from Queen Victoria School in Dunblane and Jordanhill School in Glasgow, will be performing From the Mud to the Stars - a medley of songs which includes new music composed for and with the performers and a version of the traditional song Bonnie Charlie. He said: "[Being a part of the RAF centenary] has been a great experience from beginning to end. From the Mud to the Stars has become the 'iconic' song of the project but the opportunity to write harmonies for Scottish Opera Young Company in Bonnie Charlie is another personal highlight. "RAF100 has inspired this multi-generational project, enabling us to work across Scotland with primary and secondary schoolchildren, university students and veterans. 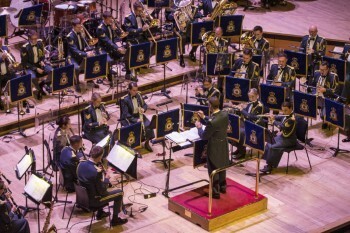 The chance to showcase their hard work at the RAF in Concert is the icing on the cake!" Also sharing the stage will be accomplished musicians from the RAF Squadronaires, Central Band of the Royal Air Force and Salon Orchestra performing rousing military marches, toe-tapping big band numbers and timeless classical pieces including The Dambusters March and Spitfire Fugue as well as the big band sound of Glenn Miller's In the Mood and Keep 'em Flying. The concert will be the last official event marking the centenary that serves to commemorate and celebrate the Royal Air Force as well as inspire the next generation of Servicemen and women. For ticket details visit the Royal Concert Hall box office at glasgowconcerthalls.com or call 0141 353 8000. The concert begins at 7:30pm.